Who are our students? Are MOOCs (massive open online courses) a threat? Does our organisation support ICT (information and communications technology) in our teaching? Learn from each other! Try things out! 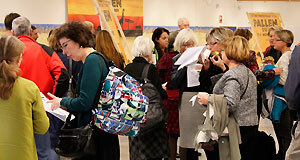 The Pedagogical Days (Pedagogikdagarna), two days of activities focused on teaching and learning, were packed with good discussion and inspiration, just as the organisers planned. Linköping University Vice-Chancellor Helen Dannetun has had lots of questions about the Pedagogical Leap. 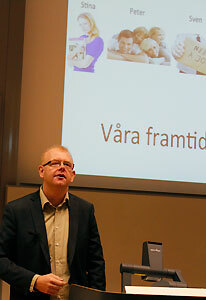 The second day of the two-day event was in Linköping, and in a speech she explained that the expression conveys the significance of these issues at the university. The Pedagogical Leap is an initiative aimed at further developing the quality of education, new learning methods and educational environments. The Pedagogical Days is part of these efforts. “We’re good, but we mustn’t lose focus,” said the Vice-Chancellor. Most of the days were devoted to the “stations” that the participants had registered for. For instance there were stations with discussions about how MOOCs could affect LiU, how ICT can be used in teaching, what the students expect from LiU, learning more about LISAM, and meeting the Vice-Chancellor at Speaker’s Corner. Opinions that surfaced during the days were that LiU needs a culture, and in particular an organisation that supports ICT in teaching. Few teachers like or know how to film, edit or handle sound. Rather than each person reinventing the wheel, there should be some sort of support structure or coaches. A request from various people was to simply try things out. Try filming! It does not matter if it is not perfect. Learn from each other! At one of the stations Magnus Moberg, teacher at IEI, spoke about how he started filming his lectures, how he developed his method and the results it has yielded. 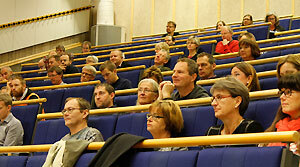 Another concrete ICT tip came from Anna Bjuremark at CUL and Olle Kordina at IFM – a sort of voting online. It is a very simple solution where the teacher can post various response options that the students vote for. It forces the students to think, be active and it generates discussion. The most provocative point of the day probably came from Gunnar Wettergren from the Department of Computer and Systems Sciences, DSV at Stockholm University. He presented his thoughts on questions such as Who are the students of today and tomorrow? How can we reach them? And can we reach all those people who, for various reasons, are not able to get an education? The traditional student is 20 to 25 years old and studies a programme at a campus. But in an age of increasing demands that the individual must continue to learn, there are also students who work full-time, have a family, or who do not even live in Sweden, and who have difficulty studying full-time, daytime, at a campus in Sweden. How do we reach them? We need to find new forms of reaching these students and making it possible for them to study, according to Wettergren. All in all, 140 people registered for the two days. There was also an opportunity for students to give teachers their opinions on challenges facing LiU, in terms of teaching and learning. Points included considering who the teacher is lecturing for, as students are not a homogeneous group. Is there some component that the teacher could do differently? Teachers should demonstrate their interest in their teaching and think about what attitude to teaching they are conveying. And – give feedback! 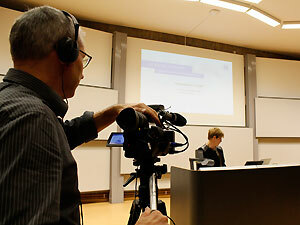 At the day on Campus Valla, several of the lectures and stations were filmed. They will be posted on the Pedagogical Leap website. Until then you can view some highlights from the day.